Justin Stein, your pilot, is a second generation pilot. Growing up in a ballooning family he was bitten by the ballooning bug at an early age. He had a dream since he was 11 years old to fly the skies in a hot air balloon. By age 18 he had gained his piloting licence and his skills were recognised when in 2002 and 2003 he won the ballooning state championships. 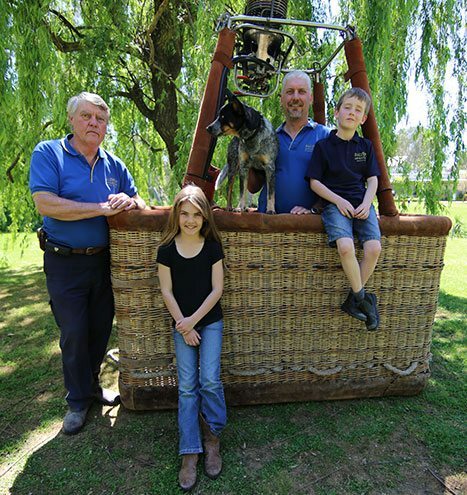 Like his father before him ( who was nominated as a South Australian Ballooning & Airship Club life member and inducted into the Australian Ballooning Federations Hall of Fame) he has a strong passion for ballooning and a commitment to excellent customer service. Justin has logged over 2900 flights and over 30 years experience flying the Barossa Valley region, and he still loves it! He has also now passed his love of ballooning onto the third generation who are eagerly awaiting the time when they too can take to the skies as pilots, and share the joy and wonder of hot air ballooning with others. Although Harlan has said he would like to be a vet in the afternoons! Barossa Balloon Adventures is the Barossa Valleys most experienced and longest running hot air balloon flight company. Justin is very proud of his impeccable safety record. Our reputation for professionalism, safety and excellence are at the heart of our operation. We love what we do and are passionate about delivering a unique and stunning hot air ballooning experience.